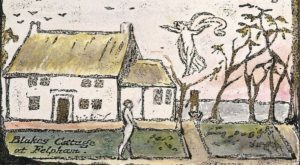 After an international campaign, the Cottage of William Blake was successfully purchased and placed into trust on 21 September 2015. William Blake (poet, artist and visionary 1757-1827) and his wife Catherine lived in the Cottage in the village of Felpham in West Sussex between 1800 and 1803. The Cottage is one of only two houses to survive of the nine residences that Blake occupied during his lifetime. It was here that he wrote the words to the hymn Jerusalem, was where he was accused of treason, and marked the beginning of the most important period in Blake’s creative life. The Blake Cottage Trust is now planning the next stage – the renovation and restoration of the Cottage. We joyfully invite your financial support.